The late Supreme leader of Singapore Lee Kuan Yew once infamously dismissed Singaporeans as “champion grumblers” condescendingly. Judging from the torrent of criticisms leveled at the PAP and its beleaguered transport minister Khaw Boon Wan online lately, there appears to be an element of truth in his jibe. A foreigner not familiar with Singapore might get the erroneous impression that Singapore’s ruling PAP will lose the next General election based on the widespread negative comments hurled against it online, but when it comes to the crunch, Singaporeans by and large will still vote for the PAP though they may not really love or support it. The PAP has ruled Singapore since 1959 and in all elections since 1980, there was never once in which its percentage of votes drop below 60%. Even during the 2011 General Election when the nation is plagued by an litany of problems such as high cost of living, exorbitant prices of public housing and yes, persistent MRT breakdowns, the PAP still manages to garner 61% of the votes and win a disproportionate 81 out of 88 seats in Parliament. In 2015, buoyed by sympathy votes after the demise of Lee Kuan Yew, the PAP romped to an impressive 70% of the votes which is more than any political party in a democratic country can garner. 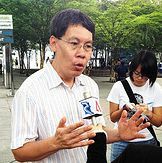 The next General election may be a few years away, but even before a single vote is cast, the PAP is guaranteed a victory thanks largely to an unthinking electorate which has been brainwashed by years of relentless propaganda in the state-controlled media that they cannot do without the PAP. So my fellow Singaporeans, please cut the hypocrisy and stop the endless whining, grumbling and ranting of the recent spate of MRT breakdowns within the safe confines of the virtual world because you are the ones who gave the PAP an overwhelming ‘mandate’ in the last General Election. You got what you truly deserve and it is time to “savor”it! In Singapore, there are three things certain in life – death, taxes and an eternal PAP government. Even if you put a monkey as a candidate in white, Singaporeans will still vote it into Parliament. Beleaguered train operator SMRT did not post any updates on its social media account on the latest train delay to hit the EW line this evening. According to commuters, they experienced a delay in their travels during the evening rush hour. Some heard announcements of a track fault near Clementi MRT station. Even the pro-PAP Channel News Asia reported the delay and contacted SMRT which has yet to respond. There are no announcements of the delay on SMRT Facebook page and Twitter page as of 9.30pm prompting widespread criticisms from netizens that SMRT is trying to suppress the news and to avoid negative publicity. The recent spate of train breakdowns was widely reported in the international media and has tarnished Singapore’s reputation. A survey done recently by Blackbox Research of 1,000 people aged 15 and over revealed that the majority think MRT is not well run and are not confident things will improve soon. Despite the shocking disruption in train service for more than 8 hours which left 70,000 commuters stranded, Transport Minister Lui Tuck Yew chose to downplay the inconveniences caused to the public and praised SBS Transit for its ‘swift’ response instead. “I think SBS T has responded more quickly and having a larger fleet of buses that they can rely on obviously has helped. Going forward, because the operators are now cooperating a lot more closely, I think that even if there is a situation which affects the lines operated by SMRT, that we would also see an improvement on the situation compared to the past,” he said to queries from the media. Mr Lui said that he had taken the North South Line to Dhoby Ghaut station and there were announcements made informing commuters of the disruption on the North East Line. He also promised a “complete check would be done along the entire stretch of the North East line at the end of service today”. “I would to sit down with SBS Transit to find the root cause of the engineering problem because it is not the same problems that SMRT faced in December,” he added. The positive sentiments expressed by Mr Lui was not shared by many Singaporeans who continue to rant at the transport companies from making their lives miserable.